I’ve learned over the 26 years I’ve lived here that this town has many fans. Those of you who were born and raised here have been blessed to always called Coraopolis home, and so many of us who hail from elsewhere are thrilled to have made that choice. Stacey and Wil Christe made the very specific decision to move here over and have never regretted it. Stacey has been a key reason that this campaign communicates so well, and her passion for our town comes through in everything she does, from her work on the Coraopolis Train Station Project and CCDF, to the Coraopolis History Archive. It’s a good time to hear directly from Stacey on what she sees as the path to even more Love [for] Coraopolis. Being busy has become a staple of our modern life. People express to me all the time that they don’t have time to get to all the things they want to do. Trust me, I get it. We all want to help and pitch in, but who has the time? Believe it or not, you do! There is so much you can do for your community that hardly takes any time at all. Small things that, taken together, make a huge impact. 2) Check in! We’re all on our devices 24/7 anymore. 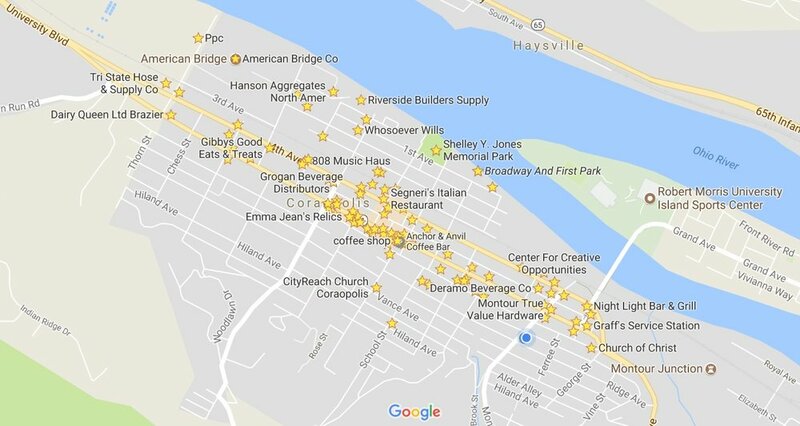 So if you use Google Maps or FourSquare or even if you’re on Facebook, check in when you go to visit a local Coraopolis business. If you loved your reiki treatment at Raion Zou, give them a full star rating or even write a short review on Yelp. When you show up for a gallery opening at Gilberti Gallery, take a pic of the studio and upload it to one of these sites. Even if everyone in town did that for one business, one time a month, the digital footprint of our town would skyrocket! 3) Use hashtags and location pins as much as you can. If you’re taking a walk and take a pic of a beautiful leafy lane on Instagram, use #lovecory or #coraopolis or #lovecoraopolis – pick one or use them all. If you can drop a pin in on Coraopolis too, do that. People who are considering moving to the area will use this information to frame their perception of our town. There are so many awesome things about Cory that they could find if we take a second to give them an easy way to find it. 4) Give credit where you can. People work hard in this community to help make it better. If you engage in the WalkWorks program, make sure to log your miles so they can get more funding. If you love the library, thank them for their help! When roadwork gets finished on a road near your house, send a message to your council member thanking them, or post a thank you to a local Facebook group. Your encouragement helps keep these people going. 5) Switch it up! “Shop Local” isn’t just a tagline: it’s how historic retail districts stay afloat and stay relevant. We’re so lucky to have our own grocery store and hardware stores and other necessities right in our backyard! Let’s keep them here. Each week, think of one thing you buy outside of Coraopolis, and buy it here instead. Switch up your Starbucks order and try picking up your morning coffee and pastry from Anchor & Anvil. Instead of trekking out to LA Fitness, take one of your weekly yoga classes right on Mill Street at Three Rivers Yoga. Instead of fighting the crowds at Petsmart, go to Off the Hook for your rabbit food. Get that bag of ice from Cash Market, get your keys made at True Value, and upgrade to a snow blower at Kuhlman’s. Each time you spend a dollar in Coraopolis, you keep our town growing. 6) Keep your donation dollars local. Did you know that you can give directly to Coraopolis charities via the United Way? Many employers now offer you the option of diverting donations, pre-tax, straight from your paycheck through the United Way. What many people don’t realize, is that when you do that, you can pick the specific charity to donate it to. The United Way number for the Coraopolis Community Development foundation is 10714715, and Coraopolis Youth Creations is currently working on getting a registration number as well. If you would like your United Way contribution to go directly to the Coraopolis Food Pantry, the United Way number is 12621629. The bottom line is, if you want your charitable giving allowance to make a tangible impact in our community, this is a great way to do it. Even five or ten bucks a month adds up! 7) Become a town ambassador! As we all know, Allegheny County is all about the neighborhoods. Together, we all need to be the Marketing Department of Coraopolis. When you’re out in the world, mention to people about the new businesses that are opening. Brag about our new microbrewery or our cool little antique district. We need to get the word out to keep these businesses alive and bring in new ones. If you know someone who is looking for a storefront, let them know that there are prime storefronts still available which can be customized to taste. Mention to friends when you plan to go to town events like pop-up markets and parades and invite them along. No one is going to know about all the cool things happening here if we don’t tell them! 8) Refocus. I get it: we all wish change could happen overnight and we all get impatient and frustrated sometimes. But here’s the thing… feelings can be contagious. Negativity can spread like a disease and squash the spirit of the people who are working their hardest to turn things around. The good news is that positivity is ALSO contagious. Refocus on positivity to improve things! Follow local groups and pages to keep up-to-date on progress and share positive changes as they happen. When you run up against something that you feel isn’t being addressed, do research: check out local websites to see if an update has been posted about your issue. If you can’t find an answer, contact your ward councilmember directly and ask them for a status. Or, if you can't reach them, just message us here and we'll track down an answer for you. If you’re truly passionate about the issue, ask how you can be involved in volunteering your time and effort to help resolve or improve the issue.